I was reading a book and a chapter was about strength index, but in 2 other books and an internet search I did not see anything related to that. I would like to know if anyone knows and could recommend me some book or website for consultation. 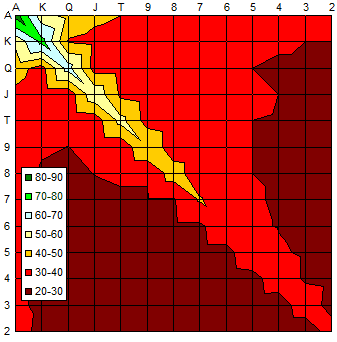 The "strength index" is established by: J = 11, Q = 12, K = 13, A = 15 (do not forget that the Ace is 15), and the numbers are worth the numbers themselves. Take the number of your largest card and multiply by 2. Add the number of your lowest card. If it is a pair in your hand, add 22. If it is the same suit, add 2. The sum is the Strength Index (SI) of your hand. Establish the ratio (R) of the smallest stack with the big blind. Look at the required SI according to R.
Similar Threads for: Strength Index, you know? I think this is an interesting idea, but I feel that those rules alone are not enough to accurately assess the quality of your hand. For one, connectors are not factored in at all. Also, I believe the value of suited cards varies heavily depending on the high card, i.e. a suited Ace is worth more than a suited Jack. It could certainly be improved to give a more complete representation, though. I think the author intended to create an easier formula to calculate the strength of inicial hands but it is a absolute value and doesn't consider the villain range, this is a vulnerability that will punish you. In Equilab you can study for free about the strength of your hands on flop against a lot of ranges. QUOTE=fernandovr;4818845]I was reading a book and a chapter was about strength index, but in 2 other books and an internet search I did not see anything related to that. I would like to know if anyone knows and could recommend me some book or website for consultation. re: Poker & Strength Index, you know? NLP is the answer. this book or this article, was targetted to Digitals... others, and I mean Visuals, Auditories or Kinesthetics will find it difficult to understand the article. It's much better to post a graph like one of the graphs below for others to understand strenght index better. If the link doesn't work, you can also just Google "Bill Chen Poker Formula". I find this formula very easy to understand. Thanks for your comment, I'll take a look at Equilab as a study material. Really with graphics gets better understanding. thanks. the link opened yes, thank you very much. This is awesome. I had developed a point system myself, not knowing that anyone had already done so. Though the scale is a little different than the two scales mentioned in the thread, I have found this very useful. It is more of a guide, than a rule. The trick here is what sum of values warrants playing the hand. 4.5 pts here gets you about 10% range, 4.0 gets you about 15% range (before accounting for position or opened pot), 3.5 gets you about 25% range (before accounting for position or opened pot. But either way this is just a starting pt. This is part of a book I am writing that will probably never be published. I had never imagined doing something like that, I'm sure I'll take a look at your method. Thanks for sharing. because it will never be published? even if it is not and you have finished would like to read it would be a pleasure. Thanks for the confidence. Actually, what started as just a lot of notes about articles, videos, actual play, etc, i realized that I needed to somehow make these notes cohesive for myself to be able to interpret what i was seeing. As I started building a better story, i started developing a strategy that went with all of it. i cash in live tournaments about 20% of the time, so I feel pretty good about it, but it is ever evolving. I Thought i had it finished once, and i had a friend take a look at a few chapters, and then I started questioning some of my conclusions. Maybe someday i will have Rev B ready for review.